LONG BEACH, Calif. – March 5, 2018 – Epson America, Inc. today announced SixB Labels, the premier source for labels, decals and bar codes in the Southwest, has purchased and installed its second Epson SurePress® L-4033AW digital label press to meet increasing customer demands in the graphic, manufacturing, food, service, beauty, and health industries. 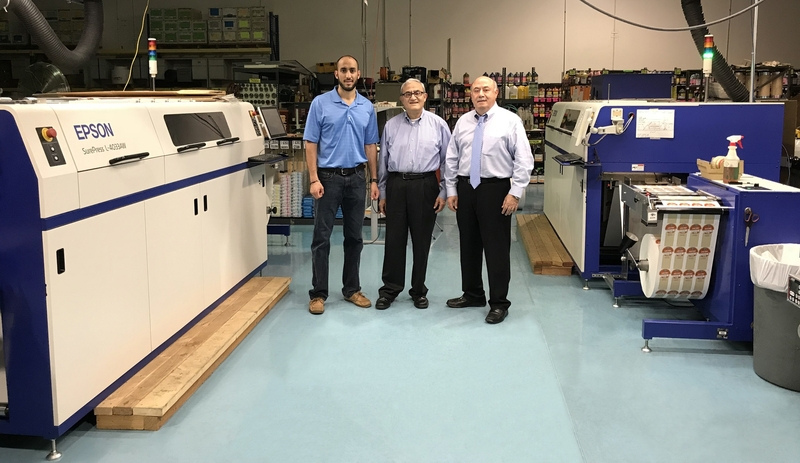 SixB Labels purchased its second Epson digital label press for its wide range of full-color label capabilities to produce semi-gloss and BOPP labels, as well as to expand its short-run label printing offerings to customers. Designed for prime label converters and commercial printers, the Epson SurePress L-4033AW is an easy-to-operate, seven-color inkjet digital label press with White ink for high-quality, short-run label printing, even on clear and metallic substrates. Delivering exceptional print and color quality, as well as innovative features, the L-4033AW allows printers to expand their service offerings. Driving the SurePress L-4033AW is the included Wasatch RIP and Print Management Software. The Wasatch SoftRIP is a sophisticated RIP solution that provides superior color management options, efficient layout features, intuitive workflow tools, variable data printing, and contour cutting, all while producing excellent quality color. For additional information, visit www.epson.com/surepress. For SurePress inquiries in the North American Western region, please contact Mark Elsbernd at 818-620-2730 or mark.elsbernd@ea.epson.com. For SurePress inquiries in the North American Eastern region or Canada, please contact Roy Pagan at 704-560-0049 or roy.pagan@ea.epson.com. Note: EPSON, SurePress and MicroPiezo are registered trademarks and EPSON Exceed Your Vision is a registered logomark of Seiko Epson Corporation. All other product and brand names are trademarks and/or registered trademarks of their respective companies. Epson disclaims any and all rights in these marks. Copyright 2018 Epson America, Inc.